This project aims to measure the impact of human activities on mountain environments, using objective and quantifiable criteria, on a worldwide scale. For this, an information sheet has been established to assess the main criteria. Translated into the different languages of the countries where Mountain Wilderness is working, it is available to mountain climbers, hikers, trekkers and climbers, so that they can contribute to this endeavour. The information will be made available to the public in a website devoted to the project, at www.mountainfootprint.org., and pinpointed on Google Maps. Through this project MW expects a better understanding of human impact and help in the decision-making process, both for environmental associations and for economic or political leaders. 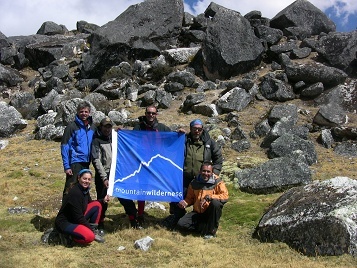 The project began with an expedition of Mountain Wilderness Catalonia in Bolivia, , and, in the summer of 2011, four of its members assessed the environmental condition of four mountainous regions of the country: Sajama, Huayna Potosi, Jhanko Laya and Acotango. The website at www.mountainwilderness.org is the main vehicle of communication for the association. Written in English, it publishes a dozen articles a year. It allows, moreover, contact with mountain lovers beyond the traditional areas of association activity. A Facebook page is maintained. More than 400 people have indicated that they like it. Internal communication is maintained by a monthly summary of the actions of the vari-ous associations, sent since April 2011, by the Secretary General. The document lists the main actions, past or future, of MW International and the various national associations, and provides, when possible, a link with the articles on the Internet. Formed on the occasion of the meeting, in Alice Superiore (Italy), of the Executive Board, this desk, attached to the secretariat, is responsible for developing relationships with organizations that work towards the preservation of mountain environments in Africa, disseminating information on environmental problems of African mountains, and developing actions and trying to create new Mountain Wilderness associations in Africa [Environmental Association of Tanzania (Tanzania), Environmental Watch association of Tanzania (Tanzania), Green Belt Movement (Kenya), Kilimanjaro Mountain Club (Tanzania), Les Lézards volants (Madagascar), Mountain Club of South Africa (South Africa), Mountain Club of Uganda (Uganda), Nomadic Adventures (Tanzania), Saint Jérôme Partage et Développement (Madagascar), Sustainable Development and Environment Preservation Association (Morocco)]. During 2011, a census was undertaken, listing the main actors of the mountain ranges in Kenya, Madagascar, Morocco, South Africa, Tanzania, and Uganda . Mountain Wilderness Program has proposed to the United Nations Environment Programme (UNEP) MW’s participation in the Shah Foladi project, in the district of Bamyan (Hazarajat). The contribution of Mountain Wilderness is to send, for one month, three groups’ expert in the fields of mapping, mountaineering and trekking organization. The publication of a handbook in English is planned thereafter, a training course for trekking guides and staff accompanying mountaineers will be organized. Funding must be provided by UNEP and the Italian Cooperation. 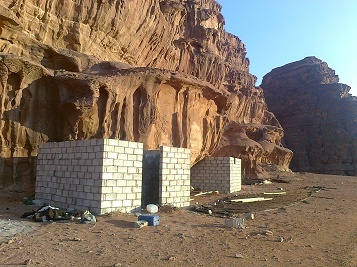 Mountain Wilderness was alerted to the threats on the desert of Wadi Rum, a site well known to climbers, part of World Heritage, where permanent structures are increasingly replacing the tent camps for the accommodation of tourists. The Asian desk has sent an open letter to the Jordanian government, the United Nations Educational, Scientific and Cultural Organization (UNESCO), the World Conservation Union (IUCN), the International Union of Mountain Guides associations (UIAGM), the alpine clubs, the mountain and trekking magazines, and the travel agencies, to alert them to the environmental degradation of the site and to request that steps be taken toward an environment-friendly tourism. Carlo Alberto Pinelli has met with the new Italian ambassador. The first contact is encouraging. Mountain Wilderness advocates, in tourism, an eco-friendly approach to the mountain. In the Vosges, MW France organized a roundtable on this subject (March 2011). In the Pyrenees, a slide show of MW France and a film of MW Catalonia, on the impact of mountain tourism in South America were held (October 2011). In Pakistan, MW Pakistan undertook talks with policy makers on the future of tourism in the Swat Valley (September 2011) and began an exploration of the Salt mountains, to promote ecotourism (October 2011). Mountain Wilderness believes that there are currently enough mechanized ski slopes and refuses to accept the opening of new areas and the interconnection of existing ones. Moreover, the expansion of ski areas in the direction of glaciers is a threat to the mountain and must be fought. In his defense of glaciers, MW Italy got the condemnation of the authors of depredation on the Marmolada (2010). MW Germany demonstrated against the construction of a cable-car in Hohen Ifen (July 2011) and opposed the equipment of Riedberger Horn (July and September 2011). MW France opposed the extension of Piau-Engaly (May 2011) and participated in a demonstration against the project (June 2011). A demonstration was held at the Chaberton against the extension of Montgenevre (February 2012). MW Italy organized demonstrations against the interconnection of San Vito di Cadore and Pescul (March 2011) and the creation of ski trails in the Cansiglio forest (November 2011). MW Switzerland fought the interconnections between Arosa and Lenzerhide (September 2011), and Andermatt and Sedrun (October 2011) and is closely following the development of new infrastructure in the Swiss Alps. MW France opposed, unsuccessfully, real estate speculation in Saint-Francois-Longchamp (June 2011) and led a lawsuit against a proposed hotel in Tignes (October 2011). Mountain Wilderness participated in discussions on the development mechanized ski. Thus, MW France met the mayor of Allevard (April 2011). Continued development in the mountains results in a decrease of permanent wilderness areas. Mountain Wilderness is mobilizing to preserve the last wild places in the mountains. The actions of opposition to destructive projects concern via ferrate (MW Germany’s demonstration in Osterfelderkopf, in July 2010); in Italy MW Italy has organized or par-ticipated in events in the Apuan Alps (April 2011) and Schievenin (May 2011), as well as the construction of a pipeline across the Apennines, still in Italy, with two MW Italy events (May and June 2011), a press release (June 2011) and the creation of a fund to finance voluntary opposition actions (June 2011). MW Italy also organized in June 2011, a demonstration in Trentino. In Switzerland, MW Switzerland requested the destruction of the illegally built elevator to the Klein Matterhorn (November 2011). MW ideas have been expressed on numerous occasions: MW Italy’s letter to the Tourism Manager in the Friuli Venezia Giulia region (September 2011), the launching, by MW France, of the “Call for the Mountain” (December 2011), MW Spain’s participation in the campaign “Mountain in Network 2010”, of the Mountains Network (Red Montañas), and a statement of MW Switzerland on the Stockhorn observation platform (January 2012). Participation in the decision-making process can sometimes prevent the introduction of destructive projects. Thus MW France participated in the drafting of the Range Scheme for the Alps (August 2011) and the public inquiry concerning the law defining the thresh-olds of environmental impact studies (2011). Since its inception, Mountain Wilderness has sought to educate practitioners of the mountain, hikers, mountaineers, and climbers… on the need to preserve this fragile environment, by adopting behaviour that does not endanger the natural environment. MW Germany demonstrated against the planned 2018 Olympic Winter Games in Bavaria (August 2011). 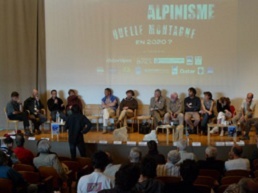 MW France participated in the reflection of the “Assises de la Montagne” (April and May 2011), with the publication of a manifesto on mountain practice, and in the monitoring of the Climbers’ charter of the Ecrins National Park (June 2011). The association joined the National Coordination of Mountain Practicing (December 2011). MW Italy held film screenings in Venice (April 2011). MW Pakistan participated, in Tajikistan, in talks about climbing (September 2010). After republishing its leaflet on off-piste skiing (winter 2010), MW Switzerland created an Internet website devoted to Clean climbing (May 2011), and published a guide on the same subject, for the Jura (June 2011). Awareness walks were organized by MW France (May 2011) and MW Switzerland (June, September, October and December 2011, January and February 2012). MW Switzerland also provided trips on snowshoes (March 2011) and Clean climbing courses (June and September 2011). MW France was present at practitioners’ trade shows: Outdoor Fait in Friedrichshafen (Germany, July 2011), Pyrénicimes festival in Toulouse (October 2011) and Euro’Meet in Annecy (October 2011). MW Belgium participated in the festival Explorimages, in Nice (France, November 2011). Since its creation, Mountain Wilderness has led actions to restore the mountains to their pristine state, by eliminating waste and abandoned facilities. 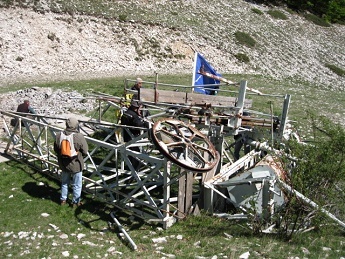 MW France mobilized 85 people for the dismantling of a ski resort in Lure (May 2011) and 80 people to pick up 8 tons of waste in Ubaye (July 2011). An inventory was organized in Goléon (August 2011). The actions of MW France in this area earned it the prize of the European Outdoor Conservation Association in Friedrichshafen (July 2011). MW Italy held a meeting on the theme of abandoned facilities in Brescia (April 2011) and published its census regarding Piedmont (2010) and Friuli-Venezia Giulia (2011). MW Pakistan organized cleanups on K2 (July 2010), Miran Jani (November 2010, January, March and August 2011) and Mt Moses’Mat (July 2011). Since its creation, Mountain Wilderness has promoted the defense of protected mountain areas and the creation of new ones. MW Italy is closely monitoring the management of the Dolomites, listed as World Heritage (press release, March 2011), and the Stelvio National Park (opposing a free ride week, April 2011, and sending an e-mail to the Presidency of the Republic). The association also mobilized against the amendment of the Law on National Parks (January 2012). For its part, MW Spain protested against holding a concert in the Regional Park of Gredos (July 2011). In France, MW France organized common actions with the Ecrins National Park (August 2011) and condemned the interconnection project, through the Vanoise National Park, between the ski resorts of Bonneval-sur-Arc and Val-d’Isère. For its part, MW Belgium organized a meeting on the theme of Protected Areas (October 2011). Obtaining a statute protecting Mont-Blanc remains a priority for the association. On this subject, MW France met the Minister in charge of the Environment (April 2011), while MW Italy organized a trek to request the listing of the range as World Heritage (2010). MW France and MW Switzerland participated actively in the work of Pro-Mont-Blanc (November 2011). MW France also requested the listing of the Aravis (April 2011) and participated in the creation of the Regional Natural Park of the Provence Baronnies (2011) and the National Park of the Calanques (November 2011). In Italy, MW Italy continued its action for pro-tection of the Cansiglio forest, with the organization of a meeting (May 2011) and the launch of a petition (October 2011). Motorized leisure is incompatible with the protection of wilderness and is opposed by Mountain Wilderness. 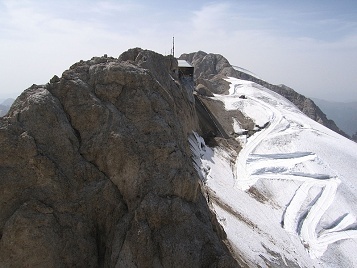 MW Italy condemned the use of helicopters to transport snow in Folgaria (December 2011) and signed, on the Marmolada, an agreement banning tourist helicopter flights (January 2012). MW Switzerland organized demonstrations against heli-skiing (April 2011 and March-April 2012), supported Federal Councillor Franziska Teuchner, who proposed banning this practice (September 2011), denounced the use of helicopters for tourist flights in Zermatt (December 2011) and Laubenhorn (January 2012), and approved the administrative report questioning the existence of landing places in the Dent Blanche-Matterhorn-Monte Rosa area. MW France obtained an administrative ban of the Cevennes Trophy, an ATV and quads race (May 2011), denounced the illegalities of the Valloire ATV gathering (August 2011), opposed to a quads and all-terrain bikes race in Trièves (October 2011). The association requested the administration to withdraw the permission granted to all-terrain vehicles in Val d’Isère (November 2011). Moreover, the Administrative Appeal Court confirmed the ban of the 2009 White Cruise (4×4, quads and motorcycles winter race, November 2011). 10,000 copies of the leaflet on motorized leisure were reprinted by MW France (2010). MW Switzerland organized, in Bern, a demonstration against off-road practicing (February 2012). MW France sought and obtained justice through the cancellation of the authorization of snowmobiling in Valmorel (December 2011) and Val Thorens-Les Menuires (January 2012). 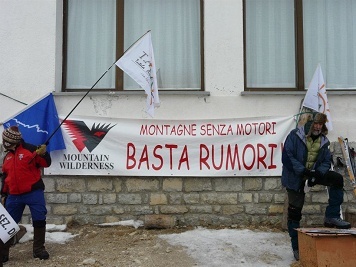 MW Italy gathered a hundred demonstrators, in Misurina, against the use of snowmobiles (February 2012). Mountain Wilderness has taken action to protect water resources in the mountains. In France, MW France participated in the Fund for the Protection of rivers, and at a conference in Annecy (May 2011). In Italy, MW Italy took part in May and June 2011, in the referendum campaign to make water public property, supporting the “Yes”, which won on June 13, 2011. For its part, MW Spain participated in the Big Jump, an action day for the protection of water streams in the Sierra de Gredos (July 2011). Water consumption and energy caused by the production of artificial snow is regularly denounced by Mountain Wilderness. MW Germany organized a demonstration against a hill reservoir in Brauneck (February 2011) and denounced the harmful artificial snow during a radio program (December 2011). In the field of energy production, Mountain Wilderness is positioning itself for the development of renewable energy sources, while remaining vigilant about the environmental and landscape impacts. MW Italy was interviewed by the Italian Chamber of Deputies about renewable energy sources (June 2011) and expressed concerns about the impact of wind farms in the mountains. An information evening on this subject was held in Imola (March 2011) and an e-mail was sent to the Government (December 2011). In Slovenia, MW Slovenia welcomed the government’s decision to scale down the proposed coal plant in Sostanj. Ce projet a pour objectif de mesurer l’impact des activités humaines sur les milieux montagnard, à l’aide de critères objectifs et quantifiables, et ce, à l’échelle mondiale. Pour cela, une fiche de renseignement a été établie, permettant d’évaluer les principaux critères. Traduite dans les différentes langues des pays où travaille Mountain Wilderness, elle est mise à la disposition des alpinistes, randonneurs, trekkeurs et grimpeurs, afin que ceux-ci puissent apporter leur contribution à cette entreprise. Les renseignements collectés seront mis à disposition du public et géolocalisés sur des cartes Google Map, dans un site Internet consacré au projet, à l’adresse www.mountainfootprint.org. MW attend de ce projet une meilleure appréciation des impacts humains et une aide à la décision, aussi bien pour les associations de protection de l’environnement que pour les responsables politiques ou économiques. Le projet a débuté par une expédition de Mountain Wilderness Catalogne en Bolivie, qui a permis, durant l’été 2011, à quatre de ses membres d’évaluer l’état environnemental de quatre régions montagneuses du pays : Sajama, Huayna Potosi, Jhanko Laya et Acotango. Le site Internet à l’adresse www.mountainwilderness.org est le principal vecteur de la communication de l’association. Rédigé en anglais, il publie une dizaine d’articles par an. Il permet, par ailleurs, des contacts avec les amoureux de la montagne en dehors des zones traditionnelles d’action de l’association. Une page est maintenue sur Facebook. Plus de 400 personnes indiquent qu’elles aiment. La communication interne est maintenue par un résumé mensuel des actions des différentes associations, envoyé depuis avril 2011, par le secrétaire général. Le document répertorie les principales actions, passées ou à venir, de MW International et des différentes associations nationales, et donne les liens éventuels avec les articles publiés sur Internet. Constitué à l’occasion de la réunion d’Alice Superiore (Italie) du Bureau international, ce bureau, rattaché au secrétariat, a pour tâche de développer des relations avec les associations qui travaillent à la préservation des milieux montagnards en Afrique, à diffuser des informations sur les problèmes environnementaux des montagnes africaines, de mettre sur pied des actions et de tenter de créer de nouvelles associations Mountain Wilderness en Afrique. Durant l’année 2011, un recensement a été effectué des principaux acteurs du milieu montagnards dans les massifs d’Afrique du Sud, du Kenya, du Maroc, d’Ouganda, de Madagascar et de Tanzanie [Environmental Association of Tanzania (Tanzanie), Environmental Watch association of Tanzania (Tanzanie), Green Belt Movement (Kenya), Kilimanjaro Mountain Club (Tanzanie), Les Lézards volants (Madagascar), Mountain Club of South Africa (Afrique du Sud), Mountain Club of Uganda (Ouganda), Nomadic Adventures (Tanzanie), Saint Jérôme Partage et Développement (Madagascar), Sustainable Development and Environment Preservation Association (Maroc)]. Mountain Wilderness a proposé au Programme des Nations-unies pour l’environnement (Unep) de participer au projet Shah Foladi, dans le district de Bamiyan (Hazarajat). L’apport de Mountain Wilderness est l’envoi, durant un mois, de trois groupes d’experts dans les domaines suivants : cartographie, alpinisme et organisation de treks. Un manuel en anglais sera publié, sur la base des résultats acquis. Par la suite, sera organisé un cours de formation d’accompagnateurs de treks et d’expéditions de montagne. Le financement doit être assuré par l’Unep et la coopération italienne. Mountain Wilderness a été alertée sur les menaces qui pèsent sur le désert du Wadi-Rum, un site bien connu des grimpeurs, inscrit au Patrimoine mondial, où les constructions en dur remplacent de plus en plus les camps de tentes pour l’hébergement des touristes. Le bureau Asie a adressé une lettre ouverte au gouvernement jordanien, à l’Organisation des Nations-unies pour l’éducation, la science et la culture (Unesco), l’Union mondiale pour la conservation (UICN), l’Union internationale des associations de guides de montagne (UIAGM), les clubs alpins, les magazines de montagne et de trek et les agences de tourisme, pour les alerter sur la dégradation de l’environnement du site et demander que des mesures soient prises pour une fréquentation touristique respectueuse des lieux. Carlo Alberto Pinelli a rencontré le nouvel ambassadeur d’Italie, les premiers contacts sont encourageants. La prolifération des aménagements en montagne entraîne une diminution permanente des zones de wilderness. Mountain Wilderness se mobilise pour la préservation des derniers endroits sauvage de montagne. Les actions d’opposition aux projets destructeurs concernent les via ferrata (manifestation de MW Allemagne à l’Osterfelderkopf, en juillet 2010) ; les carrières, comme en Italie, où MW Italie a organisé ou participé à l’organisation de manifestations dans les Alpes apuanes (avril 2011) et à Schievenin (mai 2011), ou la construction d’un pipeline à travers l’Apennin, toujours en Italie, avec deux manifestations de MW (mai et juin 2011), un communiqué de presse (juin 2011) et la création d’un fonds inter-associatif pour financer les actions d’opposition (juin 2011). Toujours en Italie, MW organise, en juin 2011, une manifestation dans le Trentin. En Suisse, MW demande la destruction de l’ascenseur construit illégalement au Petit Cervin (novembre 2011). Les idées de MW sont exprimées à de nombreuses reprises : lettre de MW Italie à l’assesseur au tourisme de la région Frioul-Vénétie julienne (septembre 2011), lancement, par MW France, de l’« appel pour la montagne » (décembre 2011), participation de MW Espagne à la campagne « Mountain in Network 2010 », du Réseau montagne (Red Montañas), et déclaration de MW Suisse concernant la plateforme d’observation du Stockhorn (janvier 2012). La participation aux instances de décision permet parfois d’éviter la mise en place de projets destructeurs. C’est ainsi que MW France participe à la rédaction du Schéma de massif des alpes (août 2011) et à l’enquête publique concernant la loi sur les seuils des études d’impact (2011). Mountain Wilderness mène une action pour la protection de la ressource en eau en montagne. En France, MW participe au Fonds pour la protection des rivières, concrétisé lors d’un colloque à Annecy (mai 2011). En Italie, MW prend part, en mai et juin 2011, à la campagne référendaire pour faire de l’eau un bien public, apportant son soutien au oui, qui l’emporte le 13 juin 2011. De son côté, MW Espagne est partie prenante du Big Jump, une journée de mobilisation pour la protection des cours d’eau, dans la Sierra de Gredos (juillet 2011). La consommation en eau et en énergie occasionnée par la production de neige artificielle est régulièrement dénoncée par Mountain Wilderness. MW Allemagne organise une manifestation contre une retenue collinaire à Brauneck (février 2011) et dénonce les nuisances de la neige artificielle lors d’une émission de radio (décembre 2011). Dans le domaine de la production énergétique, Mountain Wilderness se positionne pour le développement de sources d’énergie renouvelables, tout en restant vigilante sur les impacts environnementaux et paysagers. MW Italie est auditionnée par la Chambre des Députés au sujet des sources d’énergie renouvelables (juin 2011) et se préoccupe de l’impact des installations éoliennes sur les montagnes. Une soirée d’information sur ce sujet a lieu à Imola (mars 2011) et un courrier est envoyé au gouvernement (décembre 2011). En Slovénie, MW salue la décision du gouvernement de réduire la taille du projet de centrale à charbon de Sostanj. Mountain Wilderness défend, en matière de tourisme, une approche de la montagne respectueuse de l’environnement. Dans les Vosges, MW France organise une table-ronde sur ce sujet (mars 2011). Dans les Pyrénées, ont lieu les projections de diapositives de MW France et d’un film de MW Catalogne, consacrés à l’impact du tourisme de montagne en Amérique du sud (octobre 2011). Au Pakistan, MW Pakistan mène des discussions avec les décideurs sur l’avenir du tourisme dans la vallée de Swat (septembre 2011) et entreprend une campagne d’exploration des montagnes de la chaîne de Salt, pour y promouvoir l’écotourisme (octobre 2011). Mountain Wilderness s’engage, dès sa création, pour la défense des espaces protégés de montagne et la création de nouvelles zones protégées. MW Italie suit de près la gestion des Dolomites, inscrites au Patrimoine mondial (communiqué de presse, mars 2011) et celle du Parc national du Stelvio (opposition à une semaine de freeride, avril 2011, et courrier à la présidence de la République). L’association se mobilise également contre la modification de la loi sur les Parcs nationaux (janvier 2012). De son côté, MW Espagne proteste contre la tenue d’un concert dans le Parc régional de Gredos (juillet 2011). En France, MW France organise des actions communes avec le Parc national des Ecrins (août 2011) et condamne le projet d’interconnexion, à travers le Parc national de la Vanoise, des stations de ski de Bonneval-sur-Arc et Val-d’Isère. Pour sa part, MW Belgique organise une rencontre sur le thème des espaces protégés (octobre 2011). L’obtention d’un statut protégeant le massif du Mont-Blanc reste un objectif prioritaire pour l’association. MW France rencontre, sur ce sujet, le ministre en charge de l’environnement (avril 2011), alors que MW Italie organise un trek pour demander l’inscription du massif au Patrimoine mondial (2010). MW France et MW Suisse participent activement aux travaux de Pro-Mont-Blanc (novembre 2011). MW France demande également le classement de la chaîne des Aravis (avril 2011) et participe aux travaux de création du Parc naturel régional des Baronnies provençales (2011) et du Parc national des Calanques (novembre 2011). En Italie, MW Italie continue son action pour obtenir une protection de la forêt du Cansiglio, avec l’organisation d’une rencontre (mai 2011) et le lancement d’un pétition (octobre 2011). Mountain Wilderness estime qu’il existe, actuellement, suffisamment de pistes de ski mécanisé et refuse l’ouverture de nouveaux domaines et l’interconnexion de ceux qui existent. Par ailleurs, l’extension des domaines skiables en direction des glaciers est un danger qui menace la haute montagne et doit être combattu. Dans sa défense des glaciers, MW Italie fait condamner les auteurs des déprédations dans la Marmolada (2010). MW Allemagne manifeste contre la construction d’un téléphérique à Hohen Ifen (juillet 2011) et s’oppose à l’équipement de la Riedberger Horn (juillet et septembre 2011). MW France s’oppose à l’extension de Piau-Engaly (mai 2011) et participe à une manifestation contre ce projet (juin 2011). Une manifestation a lieu au Chaberton contre l’extension de Montgenèvre (février 2012). MW Italie organise des manifestations contre l’interconnexion de San Vito di Cadore et Pescul (mars 2011) et la création de pistes dans la forêt du Cansiglio (novembre 2011). MW Suisse combat les interconnexions entre Arosa et Lenzerhide (septembre 2011) et Andermatt et Sedrun (octobre 2011). MW France s’oppose, sans succès, à la spéculation immobilière à Saint-François-Longchamps (juin 2011) et mène une action en justice pour obtenir l’abandon d’un projet d’hôtel à Tignes (octobre 2011). Mountain Wilderness participe aux discussions sur l’évolution du tourisme lié au ski mécanisé. MW France rencontre le maire d’Allevard (avril 2011). Mountain Wilderness mène, depuis sa création, des actions destinées à rendre aux montagnes leur état sauvage, en supprimant les installations et déchets abandonnés. MW France mobilise 85 personnes lors du démantèlement d’une station de ski à Lure (mai 2011) et 80 personnes pour ramasser 8 tonnes de déchets dans l’Ubaye (juillet 2011). Un inventaire est organisé au Goléon (août 2011). Les actions de MW France dans ce domaine lui valent le Prix de l’European Outdoor Conservation Association, à Friedrichshafen (juillet 2011). MW Italie organise une réunion sur le thème des installations abandonnées à Brescia (avril 2011) et publie ses recensements concernant le Piémont (2010) et le Frioul-Vénétie julienne (2011). MW Pakistan organise des nettoyages au K2 (juillet 2010), au Miran Jani (novembre 2010, janvier, mars et août 2011) et au Mont Moses’Mat (juillet 2011). Depuis sa création, Mountain Wilderness s’attache à sensibiliser les pratiquants de la montagne, randonneurs, alpinistes, grimpeurs… à la nécessité de préserver cet environnement fragile en adoptant des comportements qui ne mettent pas en danger le milieu naturel. MW Allemagne manifeste contre la tenue des Jeux olympiques d’hiver 2018 en Bavière (août 2011). MW France participe au groupe de réflexion des « Assises de la montagne » (avril et mai 2011), avec la publication d’un manifeste sur les pratiques de la montagne, ainsi qu’au suivi de la charte d’escalade du Parc national des Ecrins (juin 2011). L’association adhère à la Coordination nationale des pratiques de la montagne (décembre 2011). MW Italie assure la projection de films en Vénétie (avril 2011). MW Pakistan participe, au Tadjikistan, à des consultations sur la pratique de l’escalade (septembre 2010). Après avoir réédité son dépliant concernant le ski hors-piste (hiver 2010), MW Suisse crée un site consacré à l’escalade en terrain d’aventure (mai 2011), et publie un guide sur le même sujet, pour le massif du Jura (juin 2011). Des randonnées de sensibilisation sont organisées par MW France (mai 2011) et MW Suisse (juin, septembre, octobre et décembre 2011, janvier et février 2012). MW Suisse assure aussi des sorties en raquettes à neige (mars 2011) et des cours d’escalade en terrain d’aventure (juin et septembre 2011). MW France est présente lors de salons de pratiquants : Salon outdoor de Friedrichshafen (Allemagne, juillet 2011), festival Pyrénicimes, à Toulouse (octobre 2011) et Euro’Meet à Annecy (octobre 2011). MW Belgique participe au festival Explorimages, à Nice (novembre 2011). La pratique des loisirs motorisés est incompatible avec la protection de la wilderness et est combattue par Mountain Wilderness. MW Italie condamne l’utilisation d’hélicoptères pour le transport de la neige à Folgaria (décembre 2011) et signe, en Marmolada, un accord interdisant les vols touristiques d’hélicoptères (janvier 2012). MW Suisse organise des manifestations contre l’héliski (avril 2011 et mars-avril 2012), apporte son soutien à la conseillère fédérale Franziska Teuchner, qui veut faire interdire cette pratique (septembre 2011), dénonce l’utilisation de l’hélicoptère à des fins touristiques à Zermatt (décembre 2011) et au Laubenhorn (janvier 2012) et approuve le rapport administratif remettant en cause l’existence des terrains d’atterrissage dans la zone Cervin-Dent Blanche-Mont Rose. MW France obtient de l’administration l’interdiction du Trophée des Cévennes, une course de 4×4 et de quads (mai 2011), dénonce les illégalités lors du rassemblement de 4×4 de Valloire (août 2011) s’oppose à une course de quads et de motos tout-terrain dans le Trièves (octobre 2011). L’association demande à l’administration le retrait de l’autorisation accordée aux véhicules tout-terrain à Val-d’Isère (novembre 2011). Par ailleurs, la cour d’appel confirme l’interdiction de la Croisière blanche 2009 (course hivernale de 4×4, quads et motos) (novembre 2011). Par ailleurs, le document de MW France sur les loisirs motorisés est réédité à 10.000 exemplaires (2010). MW Suisse organise une manifestation contre la pratique du tout-terrain (février 2012). MW France demande et obtient de la justice l’annulation de l’autorisation de la pratique de la motoneige à Valmorel (décembre 2011) et à Val Thorens-Les Menuires (janvier 2012). MW Italie réunit une centaine de manifestants, à Misurina, contre l’utilisation des motoneiges (février 2012). One Response to "Mountain Wilderness publishes its Activity Report 2010-2012"